Étang Saumâtre (in English, brackish pond) is the largest lake in Haiti and the second largest lake in Hispaniola, after Lake Enriquillo. It is also known as Lac Azuéi (Lake Azuéi); Its Taíno name was Yainagua. The Étang Saumâtre, the brackish water lake is a twin of Lake Enriquillo, is 22 kilometres (14 mi) east of Port-au-Prince on the fertile Plaine du Cul-de-Sac. The lake supports over 100 species of waterfowl, flamingos and American crocodiles, one of the few lakes of its type in the world to harbour such fauna. The colour of the lake is an intense shade of blue and this picturesque lake is skirted by brush and cacti. Etang Saumâtre, also known as Lake Azuei, is the largest lake in Haiti. Its waters are mostly brackish, and in contrast to its twin Lake Enriquillo, the lake is expanding. The lake itself is part of a chain of nearby saline lakes that lie within the valley known as the Cul-de-Sac Depression in Haiti and the Hoya de Enriquillo in the Dominican Republic. Because the region was a former marine strait, several areas of the valley are below sea level. While the lake created in a depression is 16 kilometres (9.9 mi) long and 4 kilometres (2.5 mi) wide, however, during heavy rainfall years it merges with another lake to its east known as the Enriquillo or Xaragua in the Dominican Republic, which is 27 kilometres (17 mi) long, 8 kilometres (5.0 mi) wide and fairly deep; the two together would have a water spread stretching to 60 kilometres (37 mi) length, at an elevation of 300 metres (980 ft), larger than the Lake Geneva. It is 25 kilometres (16 mi) away from the sea and Haitians call it the 'Etang Sale'. Étang Saumâtre is landlocked as it has no surface outlet. It is fed by springs emanating from calcareous rocks. The western part of the lake has slightly saline water while the eastern part has fresh water. The lake has a length, from northwest to southeast, of 22 kilometres (14 mi); its maximum width is 12 kilometres (7.5 mi). The total area is 170 km2 (66 sq mi). The lake water has an elevation of 15 metres (49 ft) with maximum water depth being 30 metres (98 ft). A sandy shore, shallow lagoons and mudflats form the eastern shore line, while the western shores have small fresh water springs and marshes. The eastern shore is state-owned, but parts of the western side of the lake are privately owned. Salinity of the lake water is now reported as 15‰ (parts per thousand). Lake water fluctuations are minimal, at about 50 centimetres (20 in), except during the drought period, when the water level could go down by 2 metres (6.6 ft). Conversely, the water level rises about 2 metres (6.6 ft) above the average during heavy rainfall years. However, it was once inferred that Azuéi’s level in Haiti and the Enriquillo lake level in the adjoining Dominican Republic had registered a drop, since Columbus had visited the area more than 500 years ago. The present assessment is that the level of the lake has been rising in recent years, forcing Haitians who live in plantation residential areas ("bateyes") around the edge of the lake to seek higher ground. Another inference drawn by a comparison between the two lakes – Azuéi and Enriquillo – which are in the same area and have the same origin (and which also become one water body during years of high rainfall) is that though they are considered "twins," they are two dissimilar bodies of water. Azuéi has a stable shore line, its waters are azure blue in colour, salinity level is low (11‰) and its surface area is relatively stable. However, Enriquillo’s water looks white-greyish in colour, its salinity levels are very high (they have risen from 36‰ to 110‰) and current water surface area (160 km2 (62 sq mi) compares to 280 km2 (110 sq mi) in 1968. The climatic conditions for both lakes are similar (low rainfall in the range of 500–1,000 millimetres (20–39 in)), within similar geological setting. Azuéi's salinity is about one fifth (1/5) the salinity of sea water. A few small rivers flow into the lake. The lake and its surrounding land are habitat for flora and fauna of several endemic species, including invertebrates, fishes and reptiles. This endemism is also common to the twin lakes, due to proximity and common history. The lake supports over 100 species of waterfowl (including flamingos), as well as American crocodiles; fresh water species of turtle, including the Hispaniolan slider and Rhinoceros Iguana. Some fishes, such as tilapia, are also found. Its recognized importance is as a breeding, passage and wintering area for numerous bird species: as many as 300–400 breeding pairs of wading birds in the Ciconiiformes can be found in the eastern zone of the lagoon. Important avian raptor species of the lake include the osprey, Pandion haliaetus. American crocodiles, Crocodylus acutus, are found in this land-locked, brackish lake in large numbers, and have instilled fear among the local community. It is one factor responsible for the poor development of the lake as an ecotourism project. Extensive studies have been reported on this species of American crocodile, as opposed to the Central American Crocodylus moreletii and the South American Crocodylus intermedius. C. acutus is widely distributed in the coastal region of the neotropics; however, it is conjectured to be surviving on the island of Hispaniola only in the salt water lakes of Enriquillo and Lake Azuéi. In 1984, there were estimated to be more than 400 individuals in and around Azuéi. It is also reported that this population is nearing extinction due to excessive hunting and poaching. 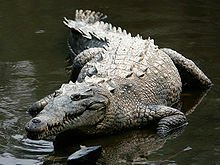 American crocodiles generally achieve a length of 4 metres (13 ft), though 6.25 metres (20.5 ft) long or 7 metres (23 ft) long specimens have been reported in the Étang Saumâtre. The lake is known for the high concentration of crocodiles at 9.6/km in certain zones, with average density of 6.3/km for all crocodile size classes. The density varies in its habitat zones, over a distance of 1 kilometre (0.62 mi) and 1.5 kilometres (0.93 mi) length from the shore line. In the rocky shores, the density was reported to be 0.2/km. However, from 1 kilometre (0.62 mi) from the shore line called the conocarpus fringe, the density was recorded as 14.5/km. They grow in size up to the age of 2 years when their size is in the range of 0.9–1.8 metres (3.0–5.9 ft). They are found in shallow water zones also and feed on Cichlids (Cichlasoma hatiensis). They remain mostly at the bottom of the lake and during bird nesting season they are found around a heron rookery to catch falling eggs of birds. Their foraging techniques vary from an active to a passive mode and they forage on non-aquatic invertebrates and also odonate larvae. Birds and fish (cichilide) are the common items of their diet. Adults also eat domestic animals such as dogs and goats, and turtles. They nest in a 6.6 kilometres (4.1 mi) stretch within a range of 7–47 metres (23–154 ft) from the shoreline, of the uninhabited eastern lake shore, near charcoal-making sites and in coralliferous limestone outcrops. Aquatic fauna of the lake consists of small Poeciliidae (Gambusia dominicensis Regan, Limia melanonotata Nichols & Myers, Limia nigrofasciata Regan) and Cichlidae (Cichlosoma haitiensis). In the past, 17,000 mirror carp fingerlings and 50,000 Tilapia mossambica fingerlings (a figure of 6,000 is also mentioned) were reportedly stocked in the lake. Fish productivity figures of the lake are not available. However, the actual catches are reported to be small, as fishing is done only on a small scale. Boats do not ply the lagoon; fishing methods are primitive and no nets are used. Ducks are hunted for food as well. The lake is in the region of dry subtropical forest and hence the vegetation around the lake is sparse, with cacti and scrub-type shrubs. Typical vegetation consists of dry-forest plants endemic to the island of Hispaniola. They include trees, shrubs and cacti: caguey (Neoabbottia paniculata), melon espinoso (Melocactus lemairei), palo blanco (Croton poitaei), pitahaya (Harrisia nashii) and oreganillo (Lantana cifferiana). The lagoon itself has several species of algae. In the fringes of the lake, Conocarpus erectus are reported and Typha domingensis are seen in the marshy region and fresh water streams and canals that have inlet into the lake. The lake has halophytic algae laid out as mattresses growing on its lake bed. Buttonwood mangroves (Conocorpus erectus) trees have large growth in the periphery of the lake. These are felled extensively to make charcoal. Deforestation and soil erosion have occurred and are occurring in the catchment of Lake Azuéi. Its water level has remained relatively stable. Increased levels of eutrophication in the form of increased growth of algae have been noted due to urban growth which is chiefly in Fonds Parisien. During heavy afternoon winds deposit periodically dropped or dumped plastics from the shore. Publicly taxed waste disposal and management rarely operate around the lake, an area which also has little law enforcement of minor littering. Haiti and the Dominican Republic and many international agencies are aware of the status of the two water bodies and the catchments drained by them. While Lago Enriquillo in the Dominican Republic has become the first Dominican Ramsar Site and is also a national park since 1996, its twin lake, the Etang Saumâtre has only been studied and is yet to receive the constructive attention for conservation of its American crocodiles and to promote ecotourism in general. However, a transboundary environmental program covering the watershed of the two lakes has been identified by the two governments to jointly initiate measures to improve the condition of the lakes and their respective catchments. This team, with professionals drawn from both countries, and with financial support from the European Union, could ensure that steps are taken to “create wise use practices for both lakes and their corresponding watersheds”. ^ Anglería, Pedro Mártir de (1964). Décadas (in Spanish). Mexico: José Porrúa e Hijos. ^ a b c Pierre, Marie Gisèle (1980). "Les Eaux Dormantes de la République d'Haïti". 1er. Colloque sur la Geologie d'Haïti. Port-au-Prince: Université d'État d'Haïti. p. 162. ^ a b c d "HAITI: Aquaculture development in the Caribbean. Report of a mission to Antigua, ..." Background. FAO Corporate Document Depository. Retrieved 2010-10-13. ^ a b c d e f "Ramsar Wetlands" (PDF). Etang Saumater. Ramsar Wetlands. Archived from the original (pdf) on 2011-08-25. Retrieved 2010-10-13. ^ a b c d e f g h i j k l m "Lago Enriquillo and Lac Azuéi, Dominican Republic and Haiti". Global Nature Fund. Retrieved 2010-10-14. ^ "Aquaculture development in the Caribbean". Food and Agriculture Organization (FAO). Retrieved 2009-10-10. ^ a b c IUCN publications (1989). Crocodiles: their ecology, management, and conservation. Ecology of the American Crocodile: Crocodylus acutus. IUCN. pp. 228, 240, 249–250. ISBN 2-88032-987-6. Retrieved 2010-10-13. "Saumâtre, Étang." The Columbia Gazetteer of North America. Columbia University Press: 2000.